Little action as the club season's mid-July lull continues. 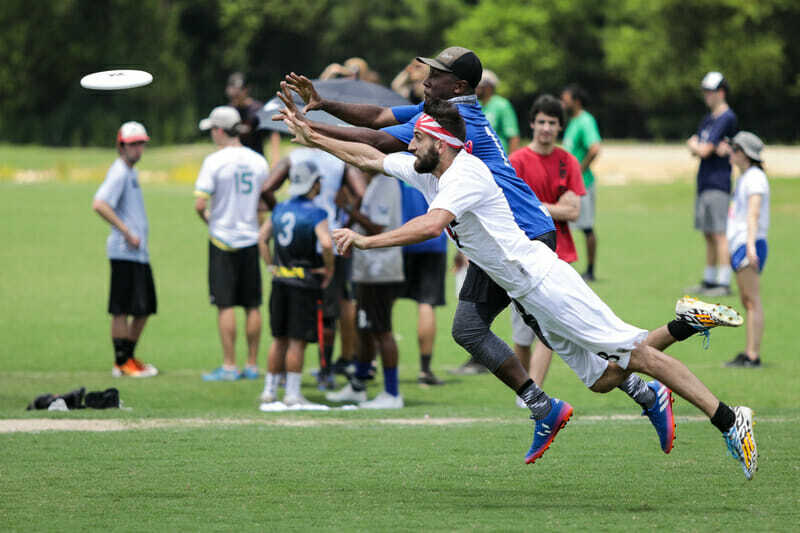 As the club season’s mid-July lull drags on, the men’s division at Terminus was the only place to catch any Top 25 teams in sanctioned tournament action this past weekend. Unsurprisingly, the two ranked squads met in the final in Atlanta, with #13 Florida United holding off #17 Atlanta Chain Lightning 13-11 to complete an undefeated weekend. Neither finalist was challenged prior to their Sunday afternoon matchup, both having worked through the weekend without ever giving up double digits to any opponent despite running open lines. With both United and Chain likely to be hanging around the bid bubble throughout the season and neither team likely to unseat Ring of Fire to top the Southeast, it will be interesting to see if the close call in the final actually hurts both teams by preventing either squad from moving up the rankings and earning the region the second bid they so desperately crave. The two North Carolina squads, Triangle Cash Crop and Durham Turbine, were the clear next tier, though neither did enough to suggest they’re ready to challenge at the top of the region. Both similarly dominated all challengers on Saturday before getting smoked in their respective semifinal. Madison Mad Men claimed the Heavyweights crown, beating Winnipeg General Strike both in pool play and then again in the tournament final, each time by just a one-goal margin. Iowa City Illusion beat out Chicago Beachfront Property for third in Loves Park. In a warm up for their upcoming appearance at the Select Flight Invite, Richmond Floodwall ran over the competition at Stonewalled, with Washington DC John Doe giving them their closest call of the weekend in the quarterfinals. Connecticut Colt beat out Pawtucket Pesterbug 15-7 in the final of Vacationland in Portland, ME, after losing to Pawtucket 13-9 in pool play. No ranked teams were in action for the mixed division, which sees no movement in this week’s rankings. Atlanta Jared Lorenzen Project cruised to a tournament title at Terminus, blowing out crosstown rival LoveShack in pool play before knocking off Asheville Cahoots 11-8 in the final. In a parity-filled Heavyweights that saw upsets galore and just a single top seed win their pool, Huntsville Method came away with a final victory over Seattle Friday Night Couch. Titan NE dominated the field at Vacationland, going 8-0 on the weekend en route to the tournament title in Portland. Despite a pool play loss, Westminster Strangers won Rocky Mountain State Games over a group of in-state rivals while Raleigh Sir Walter Rowdy followed a similar path to a title at Virginia Commonwealth Games. Despite the lack of top-flight participants, there was still some excitement in the women’s division, as favored top seeds came up short at both of the weekend’s biggest events. After taking a surprising loss to in-state foe Miami Fiasco on Saturday, top-seeded Tampa Tabby Rosa lost again to Atlanta Outbreak in the semifinals at Terminus. Outbreak would go on to win over New Orleans Queen Cake to earn the tournament victory. It was a similar story at Heavyweights, where overall one-seed Colorado Small Batch also endured a two-loss weekend. First, they were crushed by Kansas City Wicked in a Saturday crossover game, then flamed out of the bracket in the semis when Phoenix Uprising toppled them 11-7. Wicked, who went on to beat Uprising in the final, is making a strong case for inclusion in the Top 25; they now sit at 12-0 on the season with only two games closer than a four-goal margin of victory. While not an official USAU sanctioned event, #24 Ottawa Stella held off an all Canadian field at their hometown tournament No Borders — though both Toronto 6ixers and Quebec Iris were notably absent. All three of eastern Canada’s top women’s teams will be in action this weekend in Columbus. Boston Vice turned around a pool play loss to Portland Jinx, beating them in the final of Vacationland, 15-5. The Select Flight Invite (M/X/W) is the main event for the last weekend in July,1 with loads of bid implications for each division. Check out the pools and Ultiworld’s filming schedule. #15 Toronto GOAT headlines the men’s division, looking to hold off a slew of teams on the cusp — including the bottom five from our Top 25 rankings — who will be in desperate search of quality wins that could get them into the bid conversation come the end of the regular season. Florida United was a late drop from the field and has been replaced by Dayton Enigma. In Mixed, top-seeded #9 Boston Wild Card will be looking to continue their strong start to the season, for the first time getting to face some out-of-region competition. They’ll be pushed by a few other prior Nationals qualifiers looking to get back to the Big Show, including a #17 Chicago UPA squad that is very similar to one coming off a victory at Masters Nationals last weekend in Denver. The women’s division in Columbus is the only one to play host to any Pro or Elite Flight teams, with three Nationals qualifiers from last year — #19 Raleigh Phoenix, #25 Quebec Iris, and hometown #14 Columbus Rival — at the head of the pack. But the field is deep, with five additional Top 25 squads looking to work their way up the rankings. In the only other sanctioned event this weekend, 18 men’s teams and 10 mixed — all from the Classic Flight — will square off at PB&J (M/X) in College Station, TX. Comments on "Club Update: Florida United Claim Club Terminus Title, Women’s Favorites Fall"